For most New Yorkers, Grand Central Terminal is a crown jewel, a masterpiece of design. But for Clara Darden and Virginia Clay, it represents something quite different. For Clara, the terminal is the stepping stone to her future. It is 1928, and Clara is teaching at the lauded Grand Central School of Art. Though not even the prestige of the school can override the public's disdain for a "woman artist," fiery Clara is single-minded in her quest to achieve every creative success – even while juggling the affections of two very different men. But she and her bohemian friends have no idea that they'll soon be blindsided by the looming Great Depression… and that even poverty and hunger will do little to prepare Clara for the greater tragedy yet to come. By 1974, the terminal has declined almost as sharply as Virginia Clay's life. Dilapidated and dangerous, Grand Central is at the center of a fierce lawsuit: Is the once-grand building a landmark to be preserved, or a cancer to be demolished? For Virginia, it is simply her last resort. Recently divorced, she has just accepted a job in the information booth in order to support herself and her college-age daughter, Ruby. But when Virginia stumbles upon an abandoned art school within the terminal and discovers a striking watercolor, her eyes are opened to the elegance beneath the decay. 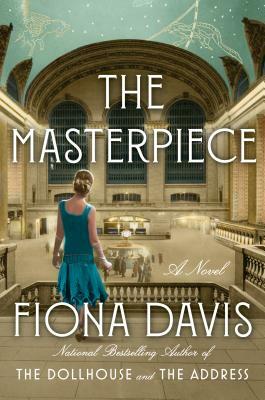 She embarks on a quest to find the artist of the unsigned masterpiece--an impassioned chase that draws Virginia not only into the battle to save Grand Central but deep into the mystery of Clara Darden, the famed 1920s illustrator who disappeared from history in 1931. Fiona Davis is the nationally bestselling author of The Dollhouse, The Address, and The Masterpiece. She lives in New York City and is a graduate of the College of William & Mary in Virginia and the Columbia Journalism School.